Goldfinches are one of my favorite birds. They are bright and cheery, even in their more somber winter plumage. They have a lilting song that is easy to recognize. And they are entertaining to watch while eating, as they display an acrobatic sense of balance. 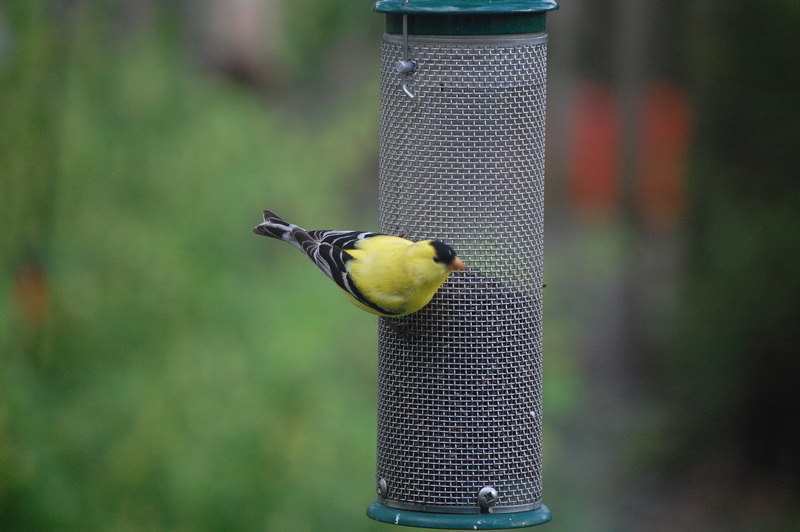 Goldfinches love seeds. So if you want them in your garden, the thing to do is plant perennials offering seeds that goldfinches cannot resist. Here are three plants that goldfinches love, and that I love for their ornamental qualities. All are native to central North America. Anise Hyssop (Agastache foeniculum). This is a fantastic all around plant. It blooms for a long period of time, with fuzzy spikes of tiny blue flowers. The edible heart-shaped foliage has a wonderful anise scent, and you can brew it into tea (it was once commonly grown as an herb). 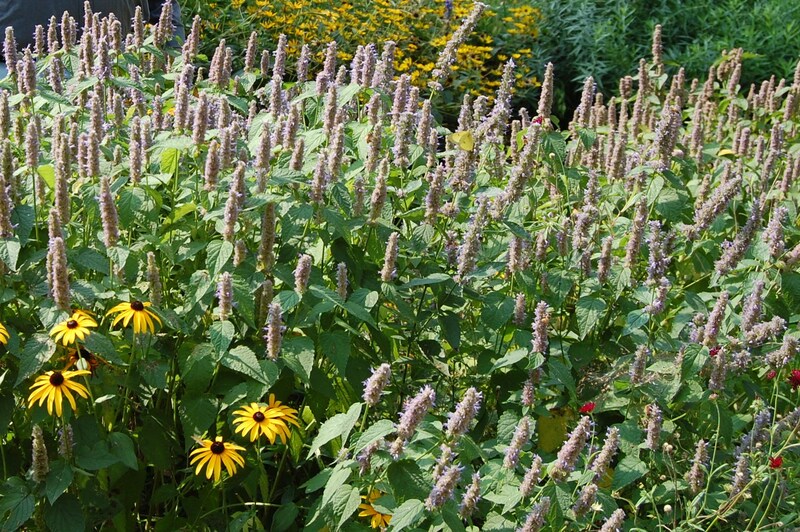 Anise Hyssop is also tough and adaptable, thriving in sun or part shade, in moist or dry soil. Two warnings about Anise Hyssop, though. First, it self-sows with abandon. The seedlings are easy to weed out, however. Second, it may need staking and/or cutting back to keep it from getting too tall (up to 4′) and flopping over. A. foeniculum is a North American native, but there are also Asian species and some popular hybrids. Brown Eyed Susan (Rudbeckia triloba). 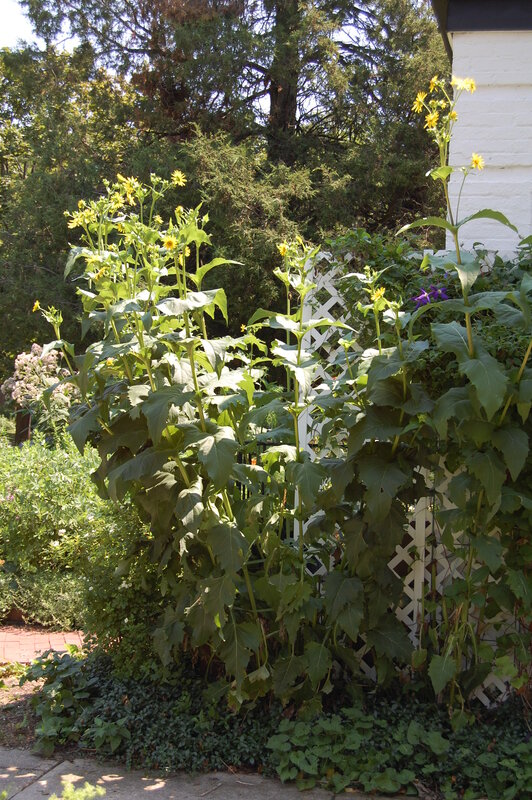 Much like Black Eyed Susan (Rudbeckia hirta), but taller and with clouds of smaller golden yellow flowers. This is another plant that will grow under diverse conditions. I’ve found volunteers growing robustly in some unlikely spots, like at the base of my Siberian Elm. Goldfinches will eat the tiny black seeds on the plant, and as the seeds scatter on the ground they will attract buntings, sparrows, and other birds. But be warned: Brown Eyed Susan self-sows promiscuously. And like Anise Hyssop, it can grow quite tall, up to 5′, but does respond well to cutting back. Cup Plant (Silphium perfoliatum). OK, this plant is not for everyone, but I love it. First thing to keep in mind is that it is big. I mean BIG, like 8-10′. Don’t say I didn’t warn you. What is it they say about big plants: architectural, makes a great specimen, etc. Yeah, all of that. I actually like the size. But there are so many great things about Cup Plant. 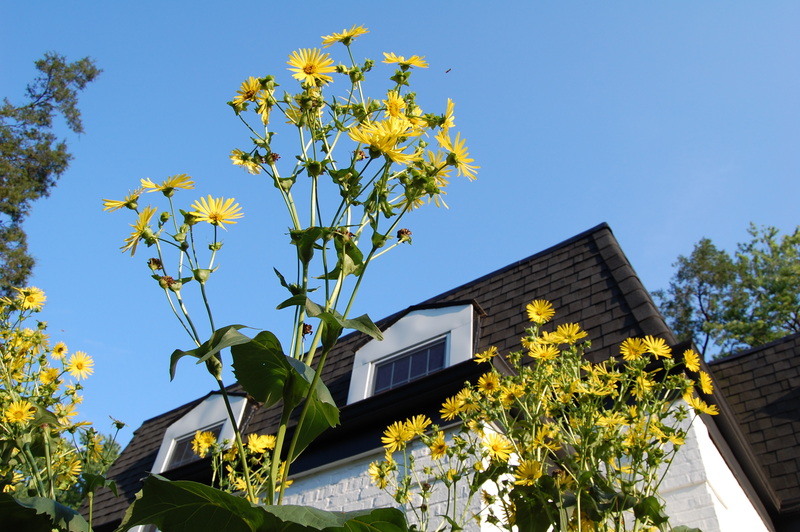 The sunflower-like yellow flowers start in July and last all summer. And the leaves are big and dramatic, almost tropical. What’s more, goldfinches LOVE the seeds. Plus, the leaves are perfoliate. That means pierced by the stem, so they form little cups that fill with rain water. Birds and butterflies drink from the cups. Cup Plant. Hello up there! A couple of warnings. First, not surprisingly, you will probably have to stake this guy. Last year I started using 10′ lengths of rebar, stuck a couple of feet into the ground. Second, be vigilant about pulling volunteers, or you will end up living in a Magical Forest of Cup Plant. Sounds kind of nice, actually, but not necessarily what you want for your garden. I should mention that Goldfinches also love the seeds of Purple Coneflowers (Echinacea purpureum) and other Echinaceas. However, these have become so susceptible to aster yellows disease in my garden that I sadly no longer count them as a personal favorite. Are you a fan of Goldfinches? What plants do they love in your garden? I fear my echinacea may have succumbed to some of the aster yellow and will see this summer. It is new to me. I agree about the goldfinches and the seeds they love. I also plant native helianthus that they devour. Love your choices as I plant them as well since they are native and wonderful bird food. The Helianthus is a huge favorite, though I have not found perennial sunflowers that I really like as ornamental plants. Just study why to plant only native plants and forget about adding cultivars to you garden, regardless of how much YOU like them. The target of a good native-plant gardener is to please the birds and insects that visit. In summer, the goldfinch love my coneflowers and striped sunflowers, but I was surprised to see them gorging on the seeds from the lemon verbena. The Niger thistle I put out in winter does not interest them much – they eat it but seem to prefer the oil sunflower seeds. When the males turn gold, it is a sure sign of spring! Yes, I watch and wait for their feathers to change. Never heard of them eating lemon verbena seeds. In my yard their interest in the nyjer seed seems to wax and wane. Hi Jason, I’m glad for the tips you’re giving about the Agastache, I was inspired to raise a tray of them from seed last year and will be planting them out in the spring. It’s really helpful to know what to expect of them from your posts and pictures. We’ll have to see if it attracts Goldfinches or any other birds. Good luck with the Agastache! I expect you will love it. Jason, I love Rudbeckia and Goldfinches. But my Rudbeckia doesn’t have seeds because of shot warm time. So I used to buy seeds for Goldfinches! Are there thistles or sunflowers you can grow where you are? Both are huge favorites of the Goldfinches. We are supposed to have Goldfinches around here, and I have some of the plants that they might like, maybe this year. I hope they find you, it may just be a question of time. You may want to try purple coneflowers or sunflowers if those do well in your garden. Also, goldfinches LOVE thistle seed, are there thistles you can grow that would not be invasive? Very sneaky of the goldfinches to eat your nyjer while you are not looking. Considering how expensive it is, you’d think the birds would be willing to provide you with a little entertainment in exchange. It may not be subtle, but I do love the color yellow. It is sad, and Echniceas are such great plants. I have both Rudbeckia and Echinacea purpureum, but the goldfinches rarely visit our area. Occasionally I will see a few, but birders here find that they like nectar at the hummingbird feeders, which I never put up for the hummers. I may hang my two feeders next year if you suggest that because I would like you get more of them in my yard. Interesting, I never heard of goldfinches at hummingbird feeders. Have you tried nyjer seed? Love those little beauties. But since Edward T Handsome arrived, and made it abundantly clear he would die of depression if I carried out my plan to make him an indoor-healthfood-junkie, I’ve had to stop feeding birds, and so seldom see goldfinches in the garden. I’m mighty glad you plant for them. Yeah, we had a cat that could not be kept inside. However, she passed away so we no longer have to worry about her homicidal tendencies. Goldfinches are in my garden year round. They are more drab looking in the winter but I see them at the feeder and they are starting to get their brighter summer plumes now. They are good fun to watch! The cup plant reminds me a little of the swamp sunflower (Helianthus angustifolius) which also gets very tall and spreads. They are not for everyone but I love them and so do the butterflies and birds! They are here year-round as well. They certainly do love sunflowers. I have not had good luck finding perennials sunflowers that I really liked as ornamental plants, but I may try an annual variety next year. Yes, one of the birds that sticks around up here most of the year, too! They’re so cheerful and encouraging. I guess they must like my Echinacea and Rudbeckia, too. (Plus the Thistle and Sunflower seeds in the bird feeders.) They’re pretty photogenic, too. I also have nyjer seed and sunflower in feeders. They are photogenic, but a little skittish so Judy sometimes has trouble getting them to pose long enough for pictures. I really enjoyed your information on attracting Goldfinches. It is February and I am just cleaning up my garden so I appreciated you comments in that regard. I have, within the past two years, started to leave the standing plants so the birds can eat the seeds. Your suggestions on alternative plantings to better serve my bird population were helpful. The photos were also great, thank you. You’re very welcome! Good luck with your birdscaping! Jason you are so lucky to have little birds in your garden. I was seriously put off echinacea species because of the disease, and the one I did try to grow didn’t seem to do too well. I am reluctantly going without Echinacea in the front, at least for a couple of years, to see if we can shake the cycle of aster yellows. In the Raleigh area we also have Goldfinches year round. To add to your list – they absolutely adore Verbena bonariensis. 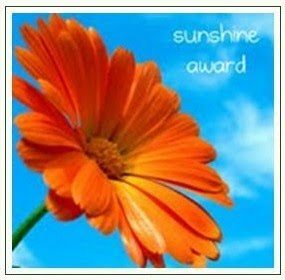 If you want them in your yard, plant this! That’s a good tip. I don’t have V. bonariensis, but I have seen that they are magnets for monarchs and other butterflies as well. 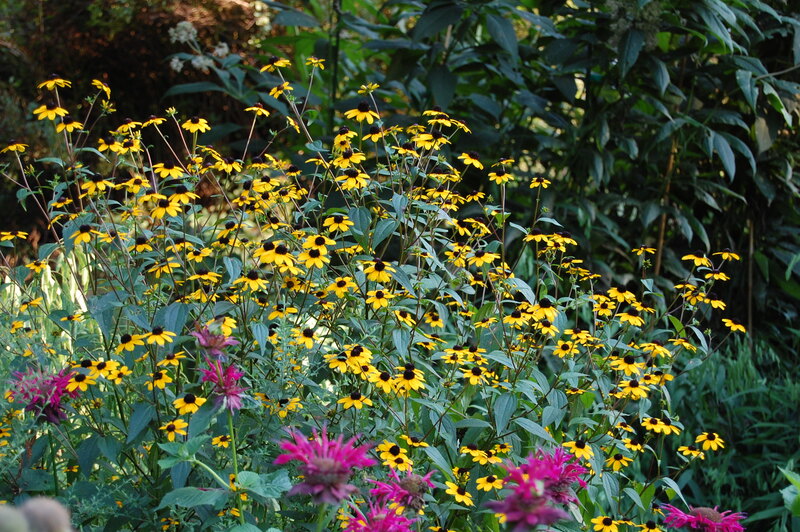 I have both rudbeckia and coneflowers which are stripped bare halfway through the winter. I’m afraid the cup plant, while lovely in the Lurie Garden, would be much too big for my garden. Question: Are there thistles that aren’t invasive? Thanks. Great question. I have never grown them, but apparently there are several native, non-invasive thistles. Their common names are Tall Thistle, Flodman’s Thistle, and Wavyleaf Thistles. Not sure how they perform in a garden setting. There are also Scotch Thistles, which are a different genus, introduced but considered only moderately invasive. Then there is Canada Thistle, which is native but also highly invasive. I sure hope that Agastache seeds in my garden. I just discovered this plant this past summer and was in love. The smell of the leaves is divine and it would be great to have more plants. Interested to hear it can be brewed into tea. I might have to give that try. It is a really great plant. I would be surprised if it doesn’t self-sow but of course plants behave so differently under different conditions. Is cupflower a native of the US? Yes, it’s a plant of the tall grass prairies. Howdy, I came by way of your comment on the Garden Walk Garden Talk post about blogging. I love the goldfinches and we get a ton of them here in Eastern North Dakota. They’re one of my favorite birds to watch (so brightly colored!!) and eagerly await their arrival every late Spring. I wasn’t aware that they liked the coneflowers so much, we have several of them, so maybe it’s time to plant some more. Welcome! I used to visit North Dakota regularly in a former life (usually Bismarck). Yes, the coneflowers are great for goldfinches and also butterflies, as you may know. I grow those plants! This was my first year for the one cup plant I decided to try. I was told the birds may plant the seeds farther than our yard, so I didn’t let it go to seed. If they pull easy enough, maybe I’ll let some go to seed this year. I live in Des Moines Iowa and every year I try to pick up as many fan flowers in hanging baskets as I can find (Scaevola aemula)… The goldfinches just love to feast on the leaves. I gave up on the niger seeds cause they just don’t eat them anymore. That’s funny, because last year I bought a bunch of fan flowers and they were absolutely torn to pieces. I assumed it was rabbits but maybe it was goldfinches. They still eat Nyjer at my feeders, though. I rarely see goldfinches in my garden but they will come to my purple coneflowers when they go to seed. Also, I planted several catnip plants this year and the goldfinches have been now been here for days, eating the seeds. They seem to love them. In regards to the agastache, yes, they love them, but bear in mind some agastache foeniculum cultivars (like ‘blue fortune’) are sterile, meaning they will not set seed. A good thing, if you don’t want it to self-sow like wild, but a bad thing if you’re looking to attract the little yellow beauties! I didn’t realize Blue Fortune was sterile – I grow the straight species. Thanks for your comment! Thanks for this article. Love goldfinches. I have a hanging-basket scaevola this year (lavender) and it attracts goldfinches! Who knew? I had the same experience – at first I thought it was rabbits. Only thing is the goldfinches tore my scaevola to bits! 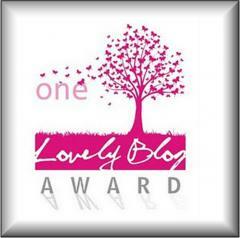 Thank you for your lovely post and great info about attracting goldfinches. In my garden I see these birds eating the seeds of purple cone flowers & black eyed susans and I feel proud that I am providing them with food. It’s so important to provide habitat when the ‘natural’ environment is becoming more urbanized every day. One of their favorite NATIVE U.S. seed sources of the American basket flower, an annual that is becoming increasingly rare. Seed are available for sale online. Please plant some and protect and share seeds for the future. Hi Aubrey, thanks for the suggestion. I am not familiar with this flower so I googled it. It looks like it would do well in my garden & I’m going to order some seeds. Such a beautiful wild flower. I completely agree. Thanks for your comment. They come here for the black eyed Susans and cone flowers, but I see the missing seeds more than I see the birds. The coneflower was the first I thought of. It was one of my favorite perennials when I lived in NH. I never knew the name of the tall Cup Plant, but also had that in one of my gardens. I miss seeing goldfinches here in Florida. But I have tons of cardinals! For the first time ever, noticed the goldfinches tearing into the unopened iris blossoms in the garden today. Have never seen them do this before! I have never seen that either! Though I have hardly any Irises. Another plant they will tear apart completely is the annual Fanflower (Scaevola).